An entire kit of marketing matching products ready to be part of your next project! A lovely pink shade to boost your photography business performance in no time! Want to create a consistent impression and attract your prospective customers without spending too much in the process? The marketing set templates from Sleeklens are designed to give you the power to spread a word about your business thus reaching many potential clients in a way that is unrivalled. While marketing your business could be costly, these templates deflate the cost by a big margin thus helping you increase your profits and capture the attention of more clients within your area. These high-end marketing materials will amaze you by how easy they are to use and the results they guarantee you at any given time. Each is designed to help you as a photographer to slash the amount of money and time you spend during the customization process. As you choose your template of choice, it is good to point out that you can easily customize it to reflect your preferences and style. You can show off your style and photography skills with these minimal designs which allow your expertise to stand out from the crowd. As you seek to break out in new frontiers, these templates will help you capture the attention of your soon-to-be customers as you create a huge first impression. Create elegant high-end marketing tools including letterheads, promo cards, thank you cards and much more with this unique marketing set template. As your photography studio advances, you need that professional look that will make everyone want to work with you. This template offers a host of tools including 5×5 Tri-fold brochure, letterhead promo card, thank you card, gift certificate, marketing board, Facebook cover, your studio logo, CD/DVD Case and 3 x CD/DVD Label Design, referral card, gift certificate and business card. It’s a rich template which you can use to send clients your information, pricing and create unique customized tools for use on their social media platforms. The template comes with customizable fonts which you can download online for use as you write your information. The Marketing Set Template |Family Adventures comes with a front and back cover, completely editable text, Layered Photoshop (PSD) files, 300 dpi and clipping masks among others. It is fully compatible with Photoshop CS+, Photoshop CC and Photoshop Elements 6+. This marketing set template comes in handy when you want to grow the scope of your photography business without any stress. This unique template offers a versatile package of tools to help you deliver a strong message to your existing and potential customers in a professional way. You can print the different communication materials or send them digitally to your clients in a way that saves time and money. If you are looking for a design with which you are able to create a lasting impression for yourself and your business, this template will come highly recommended and at a very affordable price. You can woo your customers to start booking your studio in a few easy steps or appreciate those who’ve given you business in a delightful way. As a professional photographer, you will appreciate how effective it is to follow up your clients with a ‘thank you’ message and this template gives you the exact tools you need to do this. The marketing set template| Glitter Mirage offers some features such as layered PSD files and fully editable text among others. It also contains multiple templates which you can use to grow your business. These include price list template, marketing board template, gift certificate template and CD label template to name but a few. All these are available at a fraction of a price to help grow your business stress-free. Rather than a source for different marketing tools at a huge price, Pink Realm gives you everything you need at a very affordable price. With this marketing set template, you will be getting almost one dozen of templates which are very valuable when it comes to your marketing efforts. 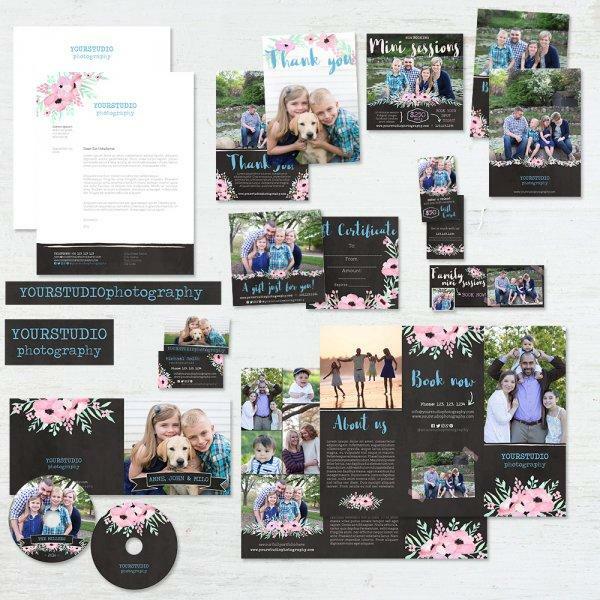 This template will deliver exquisite results whether you are wooing clients to book for photo sessions or already done the work and want to package the results in a personal way. It is an all year round kind of a template as if offers you various templates such as referral card, your studio logo, gift certificate and thank you card template among others. Pink Realm is colorful in design and offers you a unique style with which you can take your business to the next level. These templates are designed by professional photographers who seek to deliver nothing but the best into your hands. You can revamp your photography business marketing strategy with a little bit of help from these colorful and catchy marketing set templates and sit back for impressive results. They are all compatible with Adobe Photoshop CS+, Photoshop CC and Photoshop Elements 6+.